The Select local disk step of the wizard is available if you have selected to restore data from a backup file located on a computer drive. In the list of devices, select the necessary disk or disk partition and press Enter. 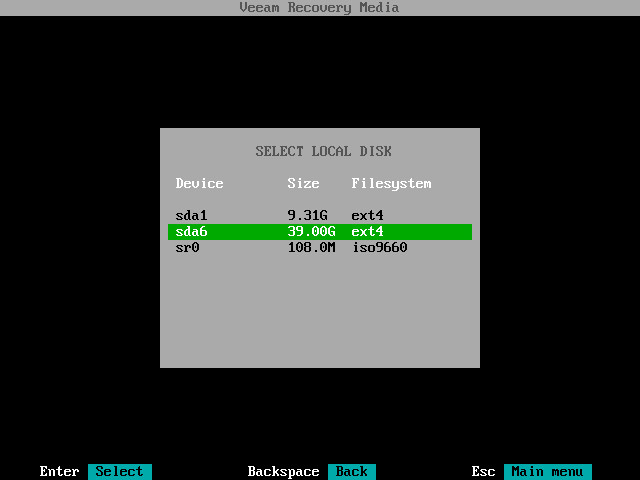 Veeam Agent for Linux will mount the selected device to the /media directory of the recovery image OS file system and display content of the directory. You can mount several devices to work with backup files that are stored in different locations if needed. To do this, return to the Select Backup Location step of the wizard and select the Mount local disk option once again. For every mounted location, Veeam Agent for Linux displays its name, type and mount point. You can view the list of mounted devices and browse for a backup file located on the necessary storage.